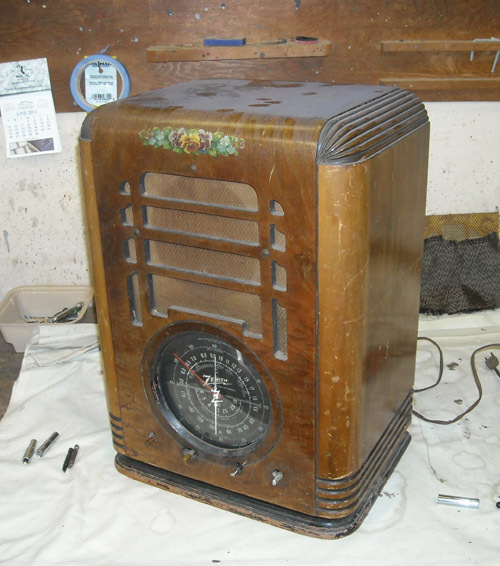 From consoles to table radios and cathedrals to tombstones, we will bring your antique radio back to life with a professional cabinet restoration and/or electronic restoration. 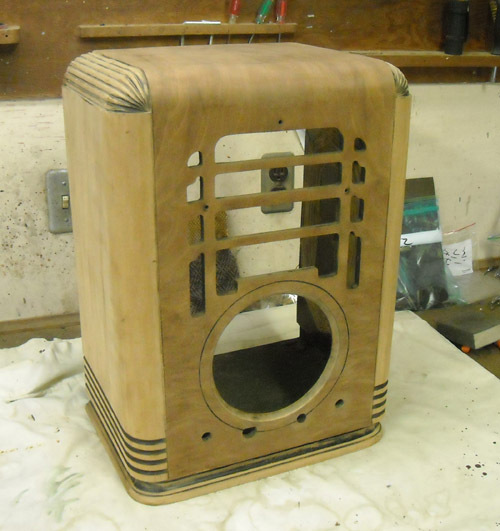 Radio cabinets undergo a vigorous restoration process. Our goal is to maintain the natural beauty of the wood and grain, while providing a deep luster and shine. We achieve this by removing all the old and worn lacquers and stains. We then sand the cabinet with fine grit pads down to the original bare wood. All nicks, chips, and blemishes are filled and/or blended. Any loose veneer is re-secured. New stains and sealers are applied by hand. We continue by using a minimum 12 coats of Mohawk brand lacquers and toners. We use a nitrocellulose piano type lacquer which is applied through a professional HVLP turbine spray system in a climate controlled room. Nitrocellulose lacquer is very thin. We also apply very thin coats. This allows the lacquer to seep into the grain and not cover it up. A 1000, 2000, & 4000 grit wet sanding follows every third coat. The cabinet is finished off with a three step polishing process ending with an Oz glaze rub. Many hours of work are put into the radios, but as you can see, the final outcome is a beautiful, natural looking cabinet with gorgeous luster& shine. Our radios are a great piece of history that come to you ready to proudly display, as well as listen to, in any room of the home or office. All tubes are tested with any weak tubes being replaced. All caps, filters, and resistors are checked and replaced as needed. All brittle or bare wiring is replaced or re-insulated. The chassis is cleaned, lubed, and re-aligned for optimal performance. A 60 day warranty is included on all the tubes, capacitors, resistors, and filters. Due to age and design of some antique radio parts we cannot warranty transformers, coils, and speakers. However, if at any time these parts would happen to fail, we will assist in repairing or replacing the defective part at minimal cost. 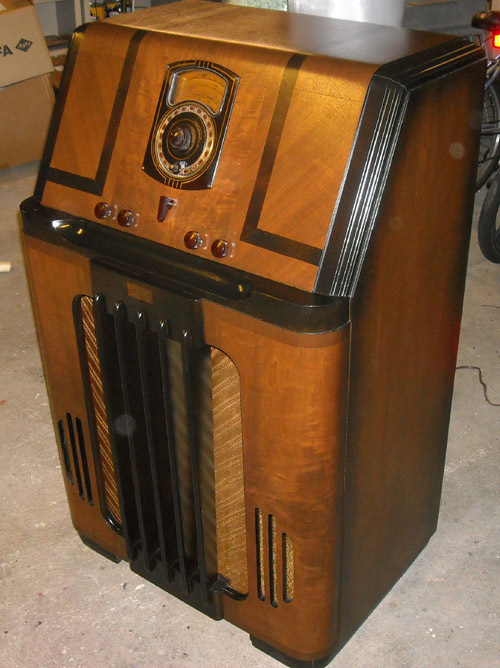 We have many suppliers to obtain the specific parts necessary for the restoration of your radio. This includes, but not limited to, all the proper electronic parts, knobs, grill cloth, dial covers, etc. 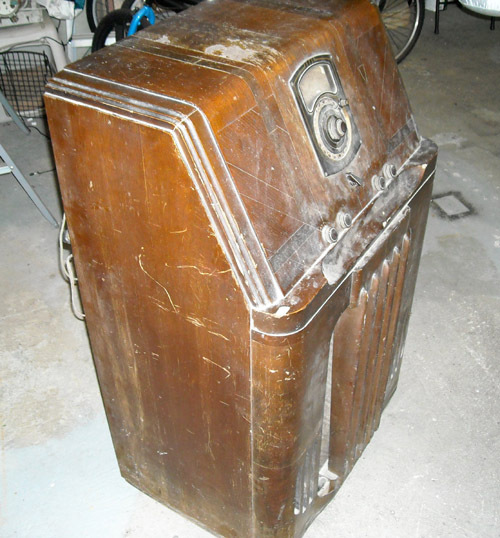 The price of a cabinet and/or electronic restoration varies from the size of the radio to the condition. By emailing us with a detailed description of the condition of your radio, inside and out, we can give you an accurate estimate. If possible, please attach several photos. Half (1/2) the payment is due upon the start of the restoration with the remaining balance (plus return shipping) due upon completion. You may ship your radio to us or drop it off. Turnaround time is generally 2- 4 weeks for table radios and 3-6 weeks for consoles. Email us at qualityantiqueradios@gmail.com for a quote, question, or to get started! 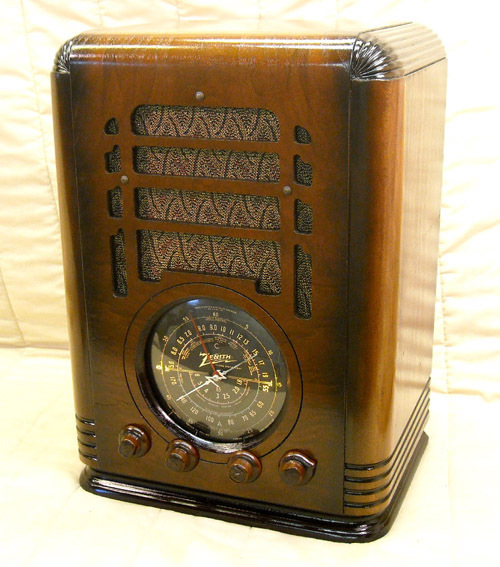 We specialize in antique radios. We make sure they are ready for your displaying and listening pleasure. We have sold and restored many sets for our valued customers, museums, high profile businesses, and as TV/Movie props. All have been extremely pleased, so proceed with confidence! When removing your radio from the box, never lift the radio from the top. Carefully lift the radio from the base/bottom. Remove the bubble wrap by hand and not by scissors or utility knife. Remove the padding/foam/and or bubble wrap from the inside of the radio. Be careful not to catch on any wires or tubes. Also be careful not to puncture the speaker. Once this is removed from the radio do a visual inspection of the tubes inside. Make sure they are seated properly and secure. Make sure all the wire connections are in place on top of the tubes if applicable. If your radio has an attached antenna make sure it is securely in place and stretch it out across the floor. Make sure the radio is in the off position and volume is turned down (refer to your knob control chart). Plug the radio in and turn the on off switch to the on position. Keep the volume level all the way down and allow the radio to warm up 45-60 seconds. Now adjust your volume level and tune in the stations! It is recommended that you do not play your radio more than a couple hours at a time. Although these sets are electronically restored they still contain vintage electronics and can become very warm during continuous play. Be sure to turn off your set and unplug it when not in use. If your radio does not power up Turn the radio off; unplug the set and check to make sure the tubes are securely in place. Make sure all wire connections are secure on top of the tubes. If it still will not power up try another outlet. If you are not receiving stations or have poor reception make sure the antenna is attached properly and extended across the floor. Make sure you are not plugged into an outlet in a room that has fluorescent lighting, microwaves, or a metal roof / siding. All of these will factor into the reception of your radio. Low flying aircraft can also interfere with reception. If the reception is poor on short-wave, be sure you are not on the Aircraft/Police frequencies. These frequencies are seldom used today. Sometimes you will need an external antenna to receive short-wave bands. Also, short-wave reception is always better late at night than during the day.